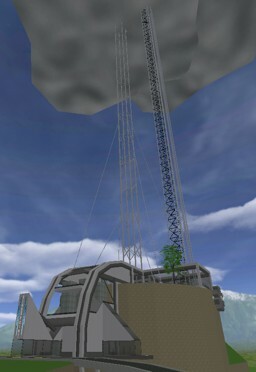 Cloudpoint is settlement in the sky (similar to Nimbus Land) accessible by a large antenna situated on top of one of the few remaining mesa's in the Avatar Mountain range. The ground level complex of the Cloudpoint Antenna is a magnificent building perched atop a near-perfectly cylindrical mesa within the Avatar Mountains. The front entrance of the complex is easily accessible to the public and is open to any visitors or tourists who wish to see the antenna itself close-up. The back entrance leads to the trail system of the Avatar Mountains. Cloudpoint Antenna stands approximately 500 meters tall; 580 meters including mountain elevation. It has two transport elevators, one which lifts passengers from the ground station up to the cradle and the other which transports passengers from the cradle to Cloudpoint. Both elevators lift at a rate of about 30m/s and have been known to cause nausea to those which can't handle the speed and quick change in elevation. The cradle of the antenna, situated 300 meters above ground, serves as a helicopter landing point and a halfway point for passengers traveling via the elevator. People visiting Cloudpoint via the elevators may have to wait extended periods of time within the cradle to wait for the elevators to be loaded and unloaded with supplies heading to and from Cloudpoint. The wait can be very uncomfortable for some as motion sickness from the swaying tower can kick in quite fast.